In this festival season, people send numbers of greeting cards to their family, relatives & friends. But how good, if you can make your own personalised “santa dance” video clip with your own face and you can share with your friend. It is possible with Iphone Apps “Santa DanceBooth”. You can download this app from iphone apps store and it doesn’t cost you anything at the moment. 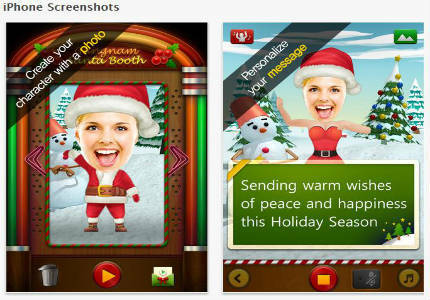 Once you download this app on your iphone or ipad then open “Santa DanceBooth” app. You can personalise this dance greeting by adding your face either by selecting your face from your picture library or you can take new fresh picture. Now you can even more personalise by typing your own message or even audio message with your own voice. Click on record button and wait until it finish, save this file in your picture folder. Now you are ready to share your own personal greeting message with your friends & family, either by email, whatsapp, Youtube or facebook.